1Vista freezes up all the time, help! Every time I start my computer it freezes. It runs fine for 30 seconds and then it just freezes and I have to manually turn it off. I have vista on a toshiba notebook. It does the same thing in safe mode. the only thing I can access is the menus you can get to my hitting F2 and F12, is there anything in those menus (Set-Up and Boot Manager...I think) that can fix my problem. Please help, cant use my computer at all!! Thanks! When your Vista freezes, the reasons can be many, and the solutions also can be many. Vista can be freeze at startup, during the internet surfing or freezes randomly or repeatedly. The key is how to find a complete solution that can throughly fix it. There are many utilities that can do this job, but most of them need you to keep running the system when you use them. Therefore, you need to find a tool that can help to run your computer smoothly, while fix your Vista freeze problem. 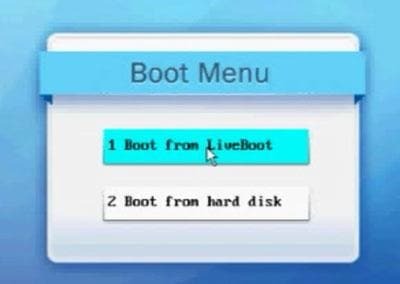 First, you can have my recommendation of the program that you need: Wondershare LiveBoot Boot CD/USB, which can help to run your frozen Vista system smoothly, as well as fix the Vista freeze issue in a few minutes. After purchasing the program, you'll get a download link from Wondershare. Download and install it on a good-working computer. 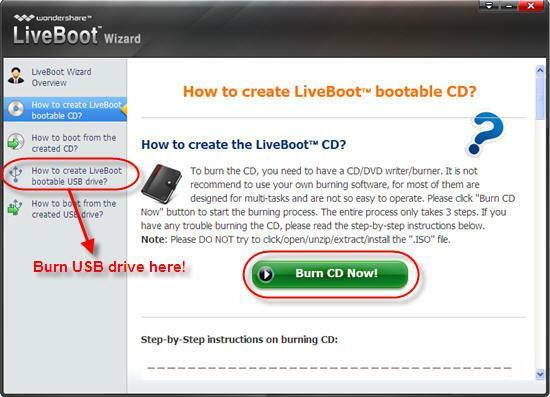 Then follow the steps below to create your own bootable CD or usb drive and fix your Windows Vista freeze issue in 3 steps. Run the program on your computer after downloading and installing it. Then a wizard-interface as follow will be displayed. Prepare a blank CD or usb drive into the computer and choose the right guide for yourself to make a bootable CD/USB. You only need to perfrom a click on the burning button in the center and the left will be done automatically by the program. After getting the bootable CD/usb drive, plug it into the your Vista computer and restart it. When the system begins to load, immediately press F12 to go to the Boot Device Menu. Then select "Onboard or USB CD-ROM Drive", and you'll get a boot menu as follow. Click "Boot from LiveBoot" to get into your frozen Vista. To access your Vista successfully, you need to spend a few minutes to wait for the Windows loading. Once you get into it, you'll get the Wondershare LiveBoot running on your computer. 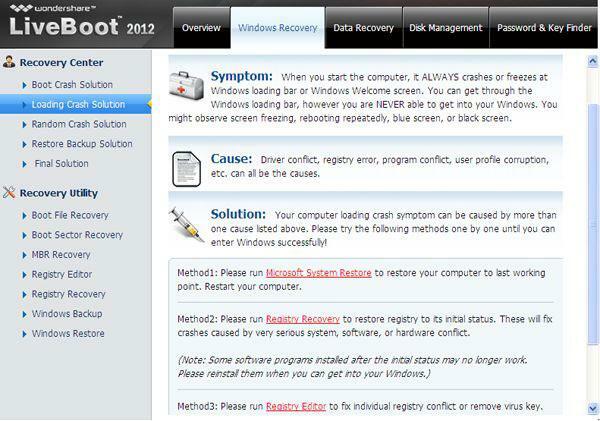 Go to the "Windows Recovery" and click "Loading Crash Solution", you'll get the interface below. Here you can get a complete solution for your Vista freezes problem. Follow the methods listed below and take measures to get your issues down. When the problem fixed, take out of the LiveBoot CD/usb drive, and restart your computer as normal. Then you'll find that you can boot your computer successfully as normal and won't freeze any more. Sometime, Windows Vista freezes often caused data lost from your computer hard drive,and it`s also possible that some files/data on pc are accidentally deleted or formatted during the process of fixing this issue, under these circumstances, you`ll probably need a hard disk data recovery tool to make sure no important photo, video, email or document file get lost because of Windows Vista freezes. Recover files in 550+ formats from any storage device quickly, safely and completely. Supported OS: Windows 10/8/7/XP/Vista, Mac OS X (Mac OS X 10.6, 10.7 and 10.8, 10.9, 10.10 Yosemite,El Capitan,Sierra) on iMac, MacBook, Mac Pro etc. How to Use Data Recovery.